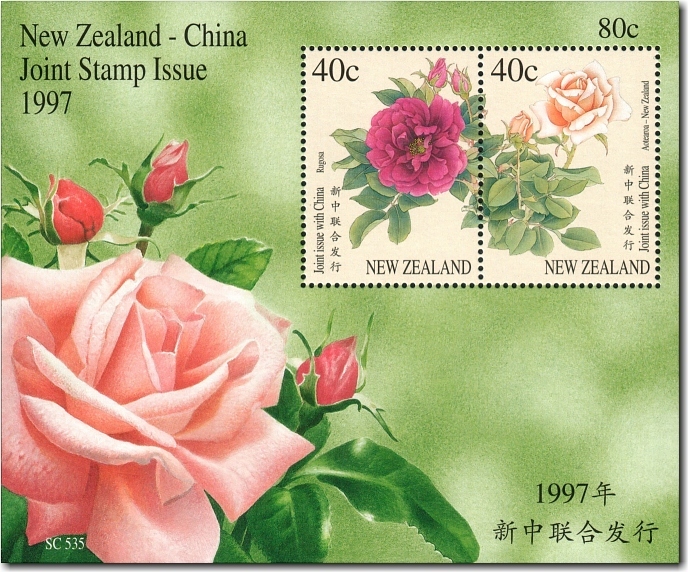 Virtual New Zealand Stamps: 1997 - Roses - Joint Issue with China. Chinese and New Zealand Issues. 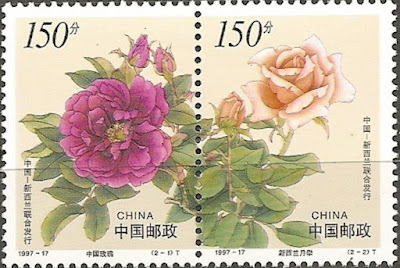 New Zealand and the People's Republic of China celebrated the beauty and splendour of the rose in this joint stamp issue. 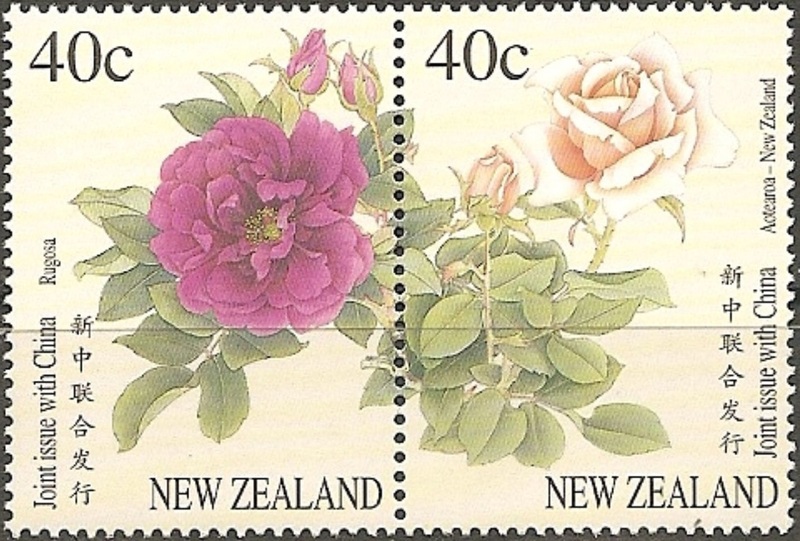 The two stamps featured the Rosa rugosa and the Aotearoa-New Zealand roses. The stamps were available as se-tenant pairs of two 40 cent stamps, as well as in a miniature sheet. Both, the New Zealand and the Chinese stamps, carried the same design and all four stamps appeared on the New Zealand first day cover. We have laid out both issues with their First Day Covers. While showing stamps other than New Zealand could be considered beyond the scope of this blog, we feel with joint issues its worth showing the issues from both countries. The New Zealand Stamps & FDC. Left-hand Stamp - 40c - Rugosa Rose / Mei Kuei. 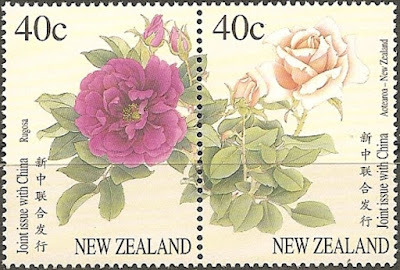 Right-hand Stamp - 40c - Aotearoa / New Zealand Rose. 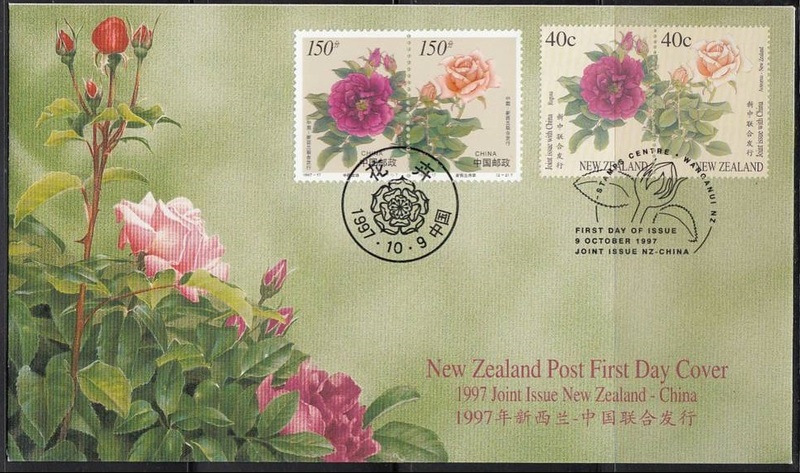 First Day Cover - 9 October 1997 (New Zealand). Notice that both issues are included here with their postal cancellations. Miniature Sheet with two 40 cent stamps. Set of two postcards featuring enlargements from photos used for the stamp issue. 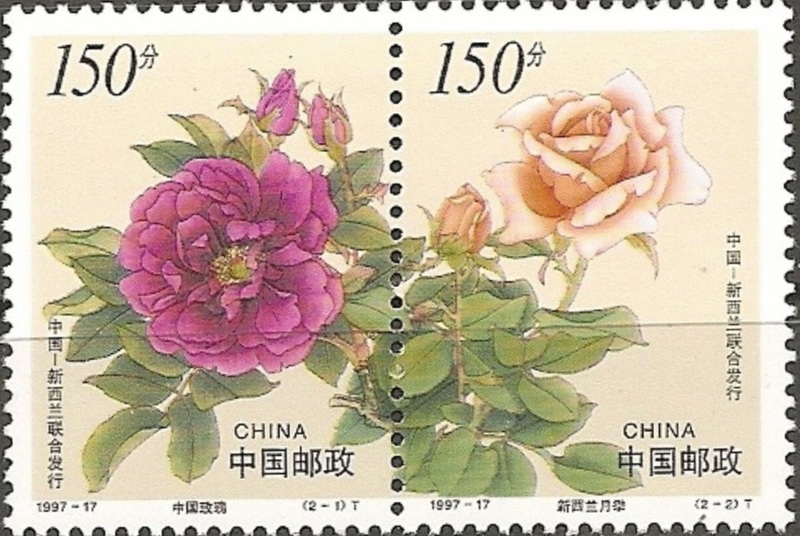 The Chinese Stamps and FDC. Left-hand Stamp - 150元 - Rugosa Rose / Mei Kuei. 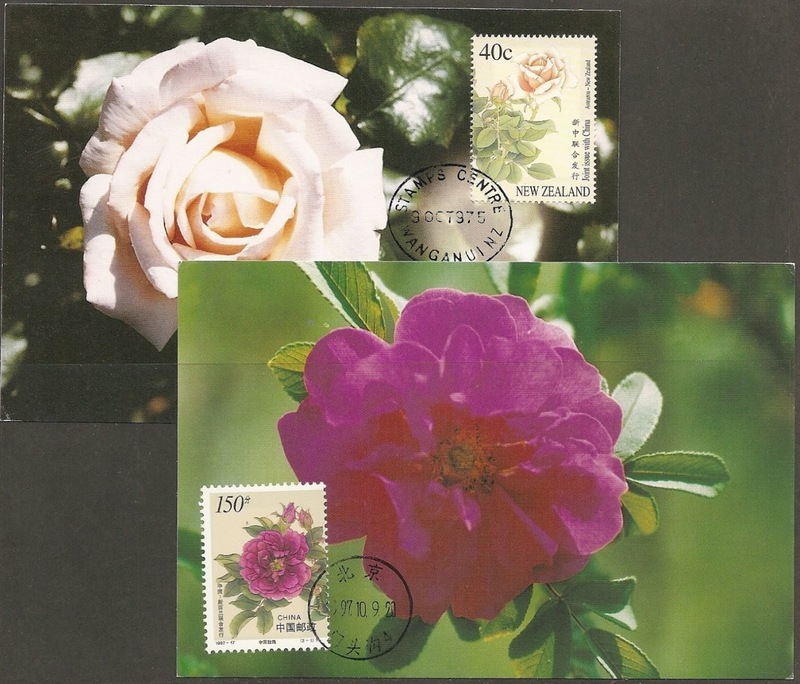 Right-hand Stamp - 150元 - Aotearoa / New Zealand Rose. 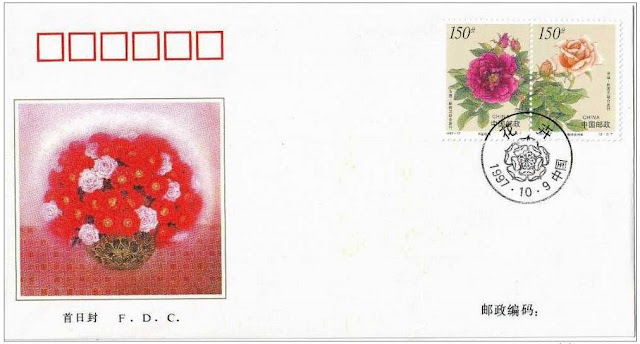 First Day Cover - 9 October 1997 (China). I am struggling to understand this cover. There seems to be a similar one on the NZ Post website. Now, this appears to be some kind of Stamp Expo although the name is not given. It might have been held at the Wellington Overseas Terminal, October 9-12 1997. Now my second problem with this cover is that it appeared to have been cancelled over a month ahead of the official First Day of Issue as stated on the NZ Post website. When we checked the official FDCs from both countries we discovered that they too had been cancelled on the 9th October 1997. I thought the mistake in the website might have been the Shanghai mimiature sheet but this was not the case either. If anyone knows anything more about this cover, we would like to hear from you. Just leave a comment below this post. Mark it "Do Not Publish" if you have included your contact details or you don't want your comment to be published. 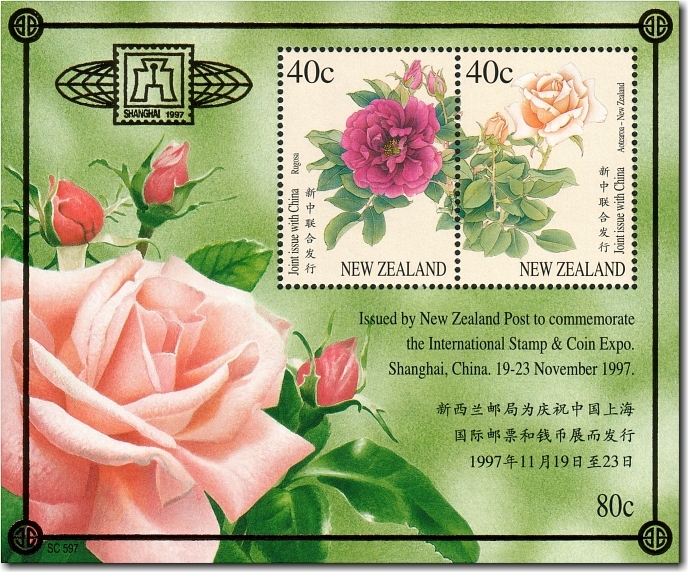 As a result of the success of the joint China - New Zealand rose stamp issue, New Zealand Post attended the Shanghai '97 International Stamp Expo in China on 19 -23 November 1997. A quantity of rose miniature sheets from this issue was reprinted with black text and the exhibition logo and a border in gold foil to commemorate the Expo and was issued on 19 November 1997. Date of issue: 9 October 1997. Number of stamps: New Zealand: two; China: two. Special blocks: Plate/imprint, positional or value blocks could be obtained by purchasing at least eight New Zealand stamps. Colour blocks, also known as 'traffic lights', were included in plate blocks of New Zealand stamps. Barcode blocks were available in both A and B block. Period of sale: These stamps remained on sale until 12 November 1998.